Prandial glucose regulators, also known as glinides, are a family of oral medicines developed for the treatment of people with type 2 diabetes mellitus. They are taken up to three times a day prior to meals – up to 30 minutes before eating - in order to limit subsequent post-meal spikes in blood glucose levels. The way they achieve this is by stimulating the pancreatic beta cells to produce more insulin for the body – similar to sulphonylureas. Prandial glucose regulators have a relatively rapid-onset, but unlike sulphonylureas only last for a short time. How do prandial glucose regulators work? Prandial glucose regulators are insulin secretagogues that cause the pancreas to release more of the blood sugar-regulating hormone insulin. Another class of drug that works this way is the sulphonylureas drug class. Prandial glucose regulators work by binding to a channel of proteins (ATP-sensitive potassium channel) in the insulin-producing cells of the pancreas (beta cells). The end result is that the insulin producing beta cells are able to produce more insulin. The way prandial glucose regulators work is very similar to the function of sulphonylureas, but the different drug classes target different sites and the result is that prandial glucose regulators are able to act quicker than sulphonylureas. Who are prandial glucose regulators suitable for? 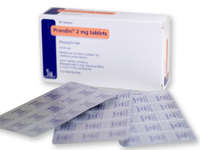 Prandial glucose regulators are suitable for people with type 2 diabetes with blood glucose levels above the NICE guideline target of 6.5%, have been prescribed metformin and have a non-routine lifestyle. Prandial glucose regulators can significantly lower blood glucose levels, and because they are rapid acting, have benefits for people with non-routine lifestyles.